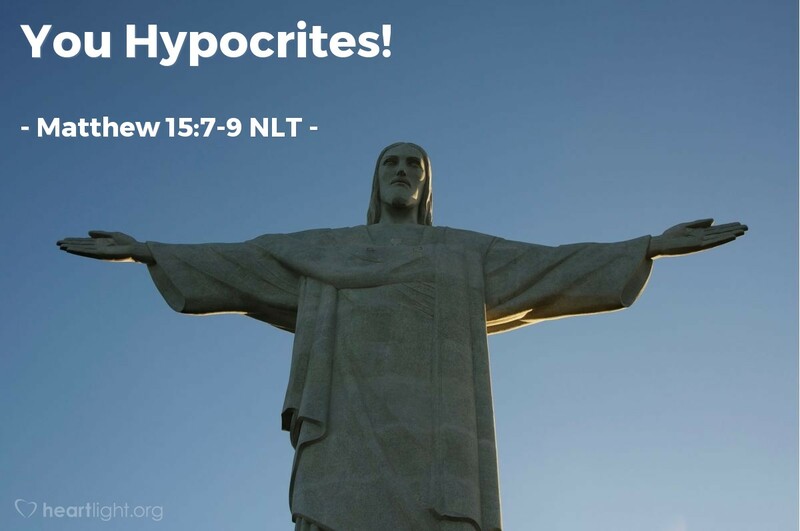 "You are hypocrites! Isaiah was right when he spoke about you. Isaiah said: 'These people say they honor me, but they don't really make me an important part of their lives. Their worship of me is for nothing. The things they teach are only rules that people have made.'" Jesus was sometimes not very subtle. His lack of diplomacy with hypocrisy was founded in the heart of God. In fact, Jesus is very hard on those who pretend to make God first in their lives and then do what they want. He'll even use the "h" (hypocrite) word when it is needed! God cannot stand it when we play like we're devoted to his will and then do what we like, want, or feel more comfortable doing. Only his will is binding. Only his will matters. Our preferences are simply that—our own opinions. They are generally neutral, unless we start replacing God's will with our preferences. It's easy to honor God with words, but he wants obedience so our character can be conformed to his own. To do less is to do wrong. Holy God, please accept my worship, praise, and thanksgiving from a genuine heart seeking to please you. Please forgive me for my sins and restore in me a holy passion to pursue you, your will, and your character with all of my heart, soul, and might. In Jesus' name I pray. Amen.